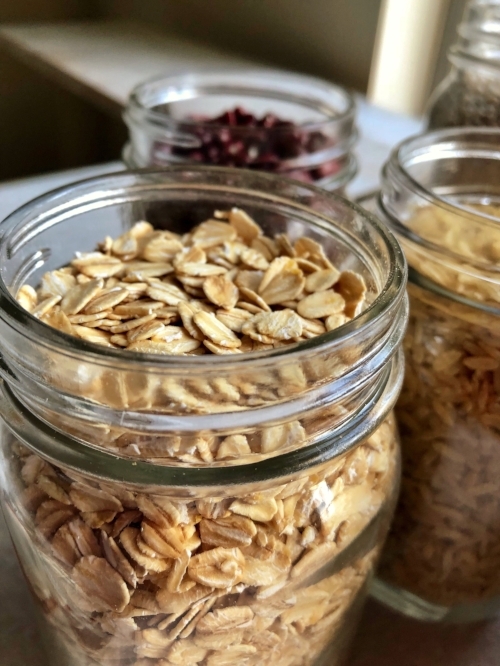 Oven canning is a method that works well to preserve pasta, rice, dried beans, rolled oats, flour, dehydrated apples, potatoes, carrots, soup peas, flour, lentils, cereals (without seeds or raisins), cake, biscuit and bread mixes, banana chips, and dehydrated dairy products. The heat kills any insects or eggs that might be present and seals the jars the same way water bath or pressure canning does. Any food product with greater than 10 percent moisture content should not be preserved by this method, because bacteria can flourish. Gather your mason jars, clean lids and rings. Clean and sterilize the jars. When dry canning, I prefer to wash my jars in the dishwasher then make sure they're THOROUGHLY DRIED. Clean the lids and rings. 5. Using a canning funnel, fill the jars. Shake the jars lightly to assure the food is settled. Leave approximately 1/2 inch headspace. 7. Heat the oven to 200 degrees. You want to gradually heat up the jars to prevent breakage from a sudden temperature change. 8. Heat the filled jars for one hour. 9. Take each jar out of the oven, ONE JAR AT A TIME. Leave the remaining jars in the oven keeping warm. 10. Wipe the jar rim clean with a damp cloth (not wet). This will also assure a good seal. 11. Place the lid and ring on the jar and tighten (finger tight). 12. Place jars on a towel and let the jars cool overnight. 13. The jars will make a popping sound while sealing. 14. You can tell the jar is sealed if the raised circle in the middle has sunken in.